When you think of a weekend in France, Paris no doubt springs to mind. Whilst it is a beautiful destination, for those looking to escape the busy city life, a weekend in the picturesque Dordogne is a far more relaxing option. The favourite holiday destination of French locals, Dordogne has a history steeped in culture with over 1000 spectacular castles dotted across its lush countryside. Not to mention all the delicious wine and food that is produced in the area. Dordogne is perfect for a weekend getaway, and here’s why. When you’ve only got a weekend to spare, the last thing you want to do is waste half a day travelling somewhere, which is one of the major draws of Dordogne. Flights from London to both Brive and Bergerac airports take less than 2 hours, leaving you with plenty of time to enjoy yourself over the weekend. Even from the moment you leave the airport and travel to your accommodation, you’ll be astounded by the stunning views that surround you. The countryside here is lush and full of beautiful greenery, with lakes and rivers spread across it that will have you itching to get out and explore. In fact, one of the most enjoyable ways to spend your Dordogne weekend is by putting on your hiking boots and walking one of the many beautiful routes in the area. As well as the beautiful countryside, Dordogne is also filled with small idyllic towns. Belves is one of the prettiest towns in the region, with some of the town’s architecture dating as far back as the 13th century. There are even numerous cave dwellings situated underneath the main square, which are definitely worth visiting - as is the outdoor pool in the town centre on a hot day. Domme is another gorgeous town, which overlooks the River Dordogne. Particularly impressive is the Porte des Tours, with its round towers that are begging to be photographed. These former prisons were used to hold the Knights Templar in 1307. 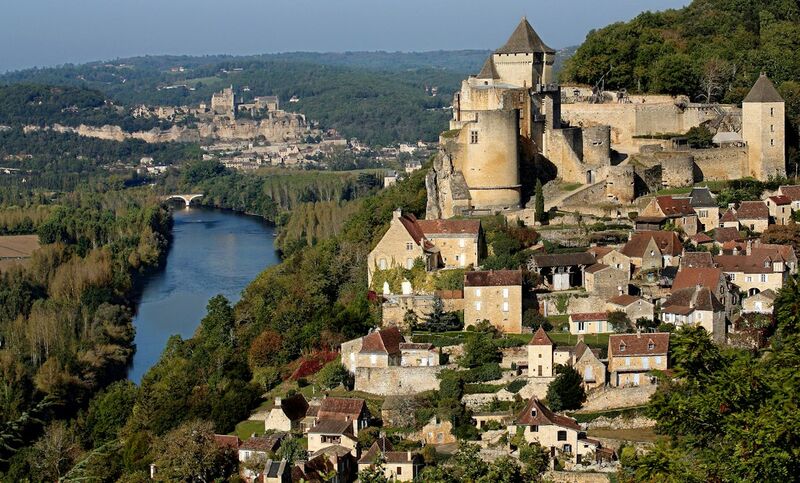 Home to an astonishing 1001 castles, makes the Dordogne a magical place to visit. Many of these castles are open to the public, and are some of the top places to visit on any holiday. One of the best ways to take in some of these castles is through a guided tour. Not only will you get to see amazing castles such as Milandes, Marqueyssac and Castelnaud, but you’ll also benefit from tour guides who know the history behind them. Plus, a day tour is the perfect way to fit in the most sightseeing into a short amount of time. Being France, you can correctly presume that the food and drink options in Dordogne are going to be exquisite. Duck and goose dishes are particularly popular in the area, so expect to see both heavily featured in menus across Dordogne. For pure opulence, a visit to the Michelin-starred Le Vieux Logis is a must. If your weekend visit includes a Friday or Monday, the restaurant offers a weekday lunch tasting menu of nine mini dishes – perfect for getting a little taste of everything. If you love wine, then a wine tasting tour is the best way to taste some of the best in Dordogne. Tours can range from half days to full days and some can be combined with a food tour too. Being an idyllic area full of castles, you might think that accommodation in the Dordogne would be expensive. Yet actually, this region has an incredibly large range of accommodation options that will suit every budget. From luxury boutique hotels in the centre of town, to countryside cottages in rural Dordogne (some of these even include castle rentals!) - there is something to fit every taste.